Monday January 11 – The day before my cochlear implant surgery. I went to the hospital for my pre-op appointments and spent the rest of the day not giving a care that it was -15°C (5°F) outside and that the next day, they would open up my head and stick an electronic device into it. My dad and I went for supper at a nearby restaurant called Le Bureau de Poste, which translates to The Post Office *shrugs*. Even though it was a Monday night, the place was crowded with mostly students. Just after waiting for about 10 minutes in the heated doorway, a lineup starts to form outside, even though the temperature has dropped to the point that the wind hurts your face. That’s right les étudiants, no need to study! Vive le Québec! The music in the restaurant was so loud that I could hear the beats, but of course, I could not tell what songs they were, but sometimes, based on the pitch and beats, I was able to guess what type of music it is. Everything on the menu is $5, so if you’re in the area, check this place out! During my appointment at the hospital, the doctor reassured me that the surgery will go well. I was now very used to the idea that I would no longer be able to hear with my ears, and that after the next day, there will be a magnet in my head. The only thing that sort of freaked me out was that I was going to go through anesthesia, and idea that a needle would make me unconscious wasn’t very appealing. 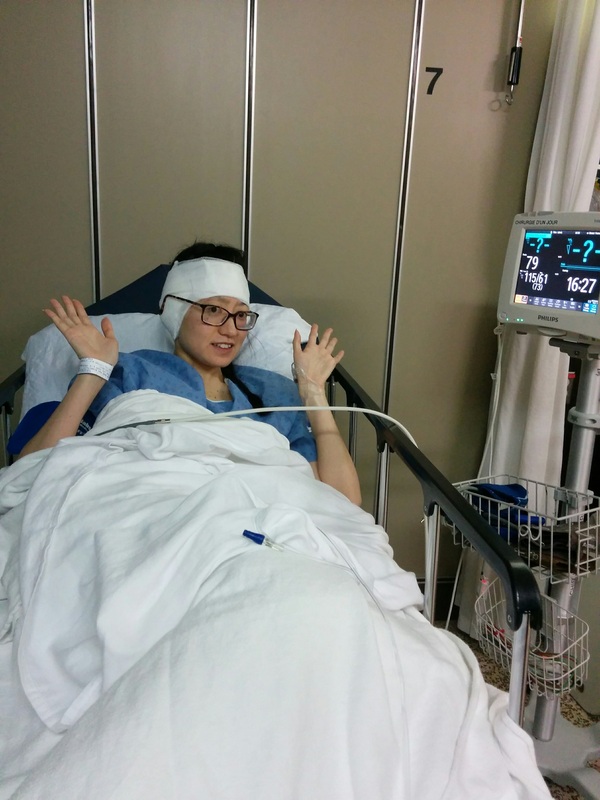 That night, I posted in a Facebook group called Cochlear Implant Experiences and said that I was having surgery the next day but I hated the idea of going through anesthesia. I received messages from many people I don’t know from all over the world telling me that it’s nothing to worry about. Another thing that I wasn’t looking forward to was that I would possibly be in pain after. I really don’t take pain very well. But then I figured, I’d rather deal with this physical pain once than with emotional pain. Physical pain can be healed with painkillers; emotional pain drags on for days, months, or even years. Tuesday January 12, 6:30 a.m. Surgery day. I woke up and opened a bottle of water as I was instructed to stop drinking water three hours before my surgery, which was scheduled for 11 a.m. I took my second shower with SoluPrep antiseptic soap as I was told to, to minimize risk of getting any infections. Then I kept drinking water until 8 a.m. I spent the rest of morning replying to messages from the many generous Facebookers who have gone through this surgery, and updating my phone – I wouldn’t want to waste time updating my phone after the surgery! 10 a.m. – I arrived at the hospital, L’hotel Dieu de Québec and checked into the one-day surgery ward on the third floor. They looked over my hospital card and my medicare card and put it in a file. They told me to to wait in the waiting room down the hall. An hour and a half later, at 11 a.m. hospital time a.k.a 11:30 a.m., my parents got up and motioned for me to get up too. They called my name through the almost-useless speakers, asking me to check into the one-day surgery ward. I walked down the hall, through the doors that led to the ward and a nurse greeted me as I entered. She handed me a hospital gown and showed me where the changing rooms are. I put it on and follow her into the ward. She led me to a stretcher and told me sit down. She got an information form out of my file and asked me questions as she glanced at it. “When is your birthday? What’s your mom’s name? Did you use the antiseptic soap twice? Did you remove all your makeup and jewelry? Do you have any heart problems? Vision problems? Hearing problems? (yes, really)” and so on. About 20 questions I had already answered numerous times. She checked my blood pressure, temperature and gave me two extra strong tylenol. Then, she gave me a waiver about anesthesia to read and sign. It explained that general anesthesia is very safe, but there are some risks associated with it. About 45 percent will get a sore throat after, one in 500 may get some nerve damage, and one in 100 000 die. I signed it and tried not to think about all the bad luck I’ve had with everything over the past year. A short while later, another nurse came to see me and asked me if I’m ready to go. I told him I was. He made me remove my glasses, which I did, then kept on talking to me. I told him I couldn’t really understand him and had to convince him to let me keep my glasses on. “You can’t hear at all?” he asked. “She can’t and needs to lipread you,” explained my mom. I wanted to add “that’s why I’m getting a CI” but then the surgeon, Dr.Brussières and one of his assistants showed up. “Ca va bien aller,” he said – everything will go well. Then they all wheeled me to the operating room down the hall. When she was satisfied with my answers, she went into the operating room and sent the anesthetist out to see me. And then we played their favorite game again. “Do you have any heart or lung diseases?” “Has anyone in your family ever had complications from anesthesia? Do you have any family members who have died from anesthesia?” Nope to all of these. The nurses came back out and pulled my stretcher into the operating room – backwards. Damn. I wanted to get a good look at the room. I could tell that the lights behind me were very bright as it felt the same way I feel when I stand right in front of stage lights during a pre-show testing. The tiles on the wall were bright-aqua colored and one huge shelf filled with medical supplies lined one whole wall. They told me not to move and slid me onto a cold, metallic operating table – the kind I’d only seen on TV minutes before going “ewww, not a hospital scene!” and switched to another channel. There were bright lights over me, that could be moved if needed. They strapped my arm to monitor my blood pressure, an oxygen sensor on my finger and stuck patches on me to monitor my heart rate, breathing and nerves. Nurse Mélanie came to talk to me, and because she had a surgical mask on, I could not really understand what she was saying as it made her speech even more muffled than it already was to me. “I can’t understand you,” I told her. “Can you take your mask off?” She said she couldn’t. I asked if she could write it down. She then moved the mask away from her mouth and asked me some really quick questions. With that, another nurse took my glasses and put them away in the case I brought with me. She then straightened my left arm and started sterilizing the inner side of my wrist. She gently stuck an I.V. needle into it. The needle was so thin that I only felt it for one second. Then, the anesthetist put another needle in and motioned to me that he was going to inject his medications. I nodded and he went ahead. Two breaths and I felt a bitter medicinal taste in the back of my throat. Another breath and I saw the lights starting to get hazy. And that’s the last thing I remember from the operating room. The cochlear implant surgery procedure has gotten a lot better over the years. It usually takes about one to two hours. When this surgery was first introduced in 1983, it took eight hours. 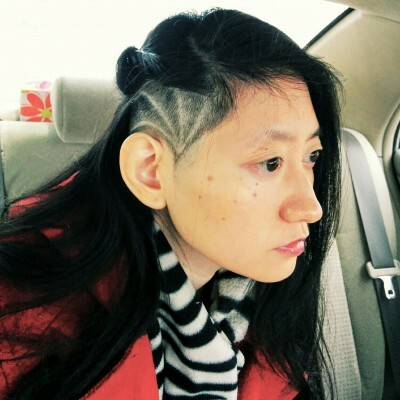 To begin, the surgeon sterilizes the incision site, and shaves off some hair if they have to. In my case, they didn’t have to because I had already gotten it shaved off by a barber who frequently does funky shave designs on rapper dudes. Check out the picture. Then, an incision is made behind the ear and the skin is lifted away from the underlying skull bone. The surgeon then drills a “pocket” into the skull where the internal device will be inserted. This is so that the chip can sit between the skin and skull without moving. Because, having a magnetic chip moving around in your head is probably not very comfortable. The skull is only drilled a little bit, and the tools and device do not go anywhere near the brain. Then, the surgeon drills a 1mm hole through the mastoid bone encasing the cochlea, through the round window membrane, through the cochlea, and inserts the thin electrode array. Refer to this blog post to see an X-Ray video of an electrode being inserted into the cochlea. Most of the time, when the electrode array is inserted into the cochlea, the inner hair cells in the cochlea get destroyed. Sometimes they don’t, depending on the type of electrode used, combined with the surgeon’s surgical skills. But when they do get killed, so does all your natural hearing. That’s one of the risks associated with getting a CI. Some have asked if balance gets affected when people get CIs. Prior to a CI surgery, some people have to undergo some balance tests, especially if the doctors suspect that they may have experience disequilibrium after. Those who do get balance problems usually do so because of an underlying cause, not because of the CI itself. Contrary to popular belief, the cochlea is not responsible for balance. Your ability to stay balanced depends on the little hair cells in two compartments above the cochlea called the sacculus and utriculus. Body motion is detected by the three semicircular canals above the cochlea. Whenever the head is moved, the fluid within the canals, called endolymph, send signals to the hair cells in the cochlea. Endolymph helps in coordinating balance. When the electrodes are fully inserted, the electrode placement, their resistances and their voltages are verified via telemetry a.k.a. wireless data transfer mechanisms, or as I like to call it, magic hospital superpowers. An audiologist is then called to test the device before the incision is closed up (whew!). The external processor, which is only worn after activation, is placed in a sterile case and placed where it will be worn and connected to a computer. Then the electrodes are tested, and an Auditory Brainstem Response test is performed to ensure that the auditory nerve is receiving the sound signals. The surgeon then closes the incision then it’s off to the recovery room. A nurse appeared. “Are you ok?” she asked. I told her I was. “Does your head hurt?” It didn’t. “Are you dizzy?” Nope. I looked at the time. It was only 2:45 p.m. “Whoa, that was fast!” I thought. They took all the machines and monitoring wires off me and said they were going to take me back to the ward shortly. Then they said it was going to be a while longer as there was no place. I looked around. Everyone else looked pretty knocked out. Nurses kept bringing meds and going to the other patients to see if they were ok. After an hour, I was tired of lying down. I asked the nurse if I could sit up. She lifted my stretcher, and I did some more watching, sitting up. They brought me back to the ward about 30 minutes later and checked my blood pressure. They wanted to make sure that I wouldn’t get nauseous when I ate or tried to walk. So they gave me a snack, which I finished in less than 5 minutes. Then they asked me to take a walk to see how I felt. I walked down the hall to the bathroom and back, and asked if I could walk more. And with that, they dismissed me, and I’ve never wanted to leave a place so much; not even the one time I got detention in high school for one stupid thing. It’s DONE! Can I get up and dance now? This article is nowhere as complete and fact-filled as I wanted it to be. It will be updated after I am able to talk to some medical professionals and hearing specialists. It will also be translated to French. Help me spread knowledge about CIs! Like my Facebook page and share the posts from there. Thank you…. I’m so glad you made it and on your way to hearing again. Your story has helped me very much. I am still very nervous never having surgery before I fell my blood pressure just going through the roof with nerves. I like the part where you close your eyes and wake up all done. My countdown is going to be long. Reading your journey has gave me some calmness. Thank you for sharing. Hi Kurt, I’m glad you feel more calm. Just remember that you won’t feel much and it really will be over before you know it! Let me know if you have any questions! Kimberley thank you for sharing and update of your implant. Amazing cover . Thanks Anita! Looking forwarding to sharing more with you!